Love the cool colors, open air and relaxed setting of a day at the beach, but don’t live on the coast? Why not capture a bit of the laid-back coastal lifestyle for yourself all year long? The Coastal Chic look brings the best of the beauty and serenity of coastal living. The Coastal Chic style is a sophisticated take on beach-inspired interiors. It’s soft and serene, evocative of the seaside but without beach house cliches or color schemes. The look is refined yet casual – a nod toward coastal living – incorporating fresh open spaces, materials found in nature, and the colors of the beach. Here’s how to bring it home. Surf, Sand, and Shells Cool coastal hues create a calm, relaxed atmosphere. Choose from a palette of soft blues, pale greens, and sandy neutrals – the colors of the beach. The Coastal Chic look also makes brilliant use of white – it’s fresh and clean and reflects light. Coastal interiors are bright and airy, blurring the line between indoor and outdoor living, so be sure to let in plenty of sun. A mixed metal-trimmed starburst mirror adds a touch of glam over a driftwood-finished mantel. Simple, comfortable fabrics are the hallmarks of this style. Inviting upholstery such as cotton, linen, or denim will help you create a laid-back setting. Sofas with slipcovers look casual, crisp and clean – particularly in white. Capture a sense of space with flowing sheer curtains that catch the breeze and let in the sunshine. Furnishings crafted from organic materials accent the coastal theme by bringing the outdoors inside – try some grasscloth wallpaper, a flat weave sisal rug, or some jute or rope accents. Burlap or wicker lend a rustic touch. Pull the look together with materials found beachside. 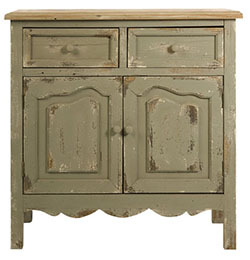 Driftwood accents and whitewashed wood have a just-washed-ashore weathered appeal. A piece of coral, smooth stones, or other found objects stacked in a clear glass cylinder add seaside glamor. Natural elements bring warmth and texture to your interior, but keep it simple – don’t “go overboard” with piles of shells on every surface. Use a palm branch or bamboo in a tall vase instead of a floral arrangement. 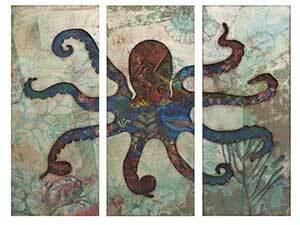 Hang a mini-gallery of vintage prints depicting ocean life intertwined with mirrors or add a stylized mermaid or octopus to reflect the maritime theme. Not just for the beach-house, not only for summer, the Coastal Chic look can help recreate a moment in time, capturing the essence of a peaceful day at the beach.